Make playtime fun again, filled with imagination and laughter. To many toys today require batteries and quick thumbs, I know, I'm a victim of it as well. Let this whimsical toy remind you of the fun that kids should be having using their imaginations and participating in real active playtime. 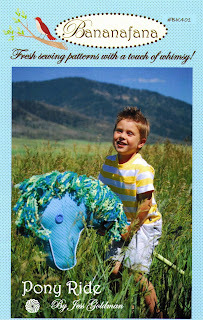 Boys and girls will get a kick out of galloping around with this pony! I just added you to my bloglines. Cute patterns! I love your patterns. This is the best thing on a stick since the popsicle! Hi, I just read your article on jolly jabber - i have seen your stuff online - i think maybe at fat quarter shop, anyway, welcome to the world of designing, and by the looks of it, I am sure u will have great luck. With a great supportive system (hubby), and adorable inspiration(kids) and a super duper attitude, I am sure u will do well. I do not have children, (boo hoo) - ( my boxer dog would look silly dressed in a skirt - or woouullld he????!) but I love the horse stick toy - and agree less toys with batteries - great idea. I used to have horses for many years - lost "my main man", Micah, after 18 fantastic years with him! So, obviously I have a special place in my heart for horse themed items! Good luck on your ventures and enjoy your day!